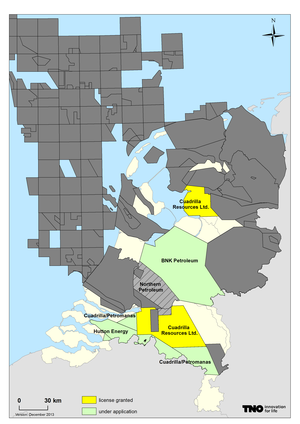 The Netherlands has been a large producer and consumer of natural gas since the development of the Groningen gas field in the 1960s, the largest natural gas field in continental Western Europe. Current forecasts show that production from conventional onshore and offshore fields will decline noticeably in the next decades, but the Netherlands still has the ambition to sustain its prominent role in the northwest European gas market and aims to be able to meet future demand. Energie Beheer Nederland (EBN), the Dutch state participant in energy projects, has stated the ambition to achieve 30 BCM production of gas in 2030 from small fields. This will require large investment into under-explored areas, new technologies and also, most probably, the development of challenging reservoirs such as shale gas. The Netherlands Organization for Applied Scientific Research, TNO, is an independent research organization, which aims to enable a robust transition to sustainable energy supply. TNO invests in environmentally friendly alternatives to fossil fuels, but also looks to find the most optimal and clean uses of fossil fuels, during the transition to more sustainable solutions. Of these transition fuels, natural gas is expected to play the largest role, being a relatively clean fossil fuel. As a research institute and geological survey for the Netherlands, TNO has a broad knowledge of the Dutch subsurface; it governs the database containing all data and information on the subsurface of the Netherlands. By using existing data from this database, a first evaluation from TNO in 2009, commissioned by Energie Beheer Nederland (EBN), confirmed strong potential for shale gas in the Netherlands, although these high estimates were presented with large uncertainties. Due to these large uncertainties in gas-in-place estimates, there are many views on the potential of shale gas resources in the Netherlands. TNO currently works on refining shale gas estimates based on additional data collection and an integrated multidisciplinary approach. Investigations focus on Jurassic Posidonia shale formation and the deeper Namurian shales. Besides reserve estimations, TNO researches methods and technologies relevant to possible future shale gas exploitation. This includes research into the minimization of surface footprint, monitoring and simulating of hydraulic fracturing, and looking at alternatives to stimulation. Well integrity and wastewater treatment options are further fields of research. These studies often take place in close co-operation with other research organizations, universities, or with industry. Also, TNO has taken the lead in the European Energy Research Alliance (EERA) Joint Program on Shale Gas. Together with over 24 research institutes and universities, we create a transparent and independent knowledge platform on shale gas and provide a research-based understanding of technology and methods, which addresses the concerns that are raised regarding shale gas development. Recently the M4ShaleGas consortium, a consortium of EERA JP Shale Gas members, got a European project awarded under the 2014-2015 H2020 LCE16 call. The M4ShaleGas stands for “Measuring, monitoring, mitigating & managing the environmental impact of shale gas”. The general objective of the M4ShaleGas program is to provide scientific recommendations for minimizing the environmental footprint of shale gas exploration and exploitation in Europe, a website will be available in Q3 2015. Exploration and the expected production of shale gas in the Netherlands has given rise to public resistance [e.g. Haaren, Boxtel]. TNO provides data and information on shale gas development. Recently, TNO has initiated the development of an “Argument Map” for shale gas exploitation in EU member states, available in four languages. This map shows in a concise and clear way, the arguments of all stakeholders (operators, water companies, NGOs, research institutes, etc.) and it can be used as guidance for further discussion. 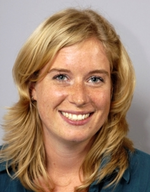 In reaction to the shale gas discussion, the Dutch Ministry of Economic Affairs set out a study in 2011, on the possible risks and effects of exploration and exploitation of shale gas, which was carried out by Witteveen and Bos, Arcadis and Fugro. The resulting advice, published in 2013, was that additional research is necessary to determine the local effects on people and nature, and that environment location-specific investigations are needed, for instance in the form of an environmental impact assessment. The final Structural Vision is planned to be finished end of this year. Based on these studies the Minister announced there will be no commercial shale gas development in the next 5 years. The Energy Report 2015, which is in development, will indicate whether or not it is desirable to exclude development of shale gas in the Netherlands on the longer term. The Energy report is a report of the Ministry which gives an integral vision on the energy supply in the Netherlands, taking into account topics and dilemmas relevant for a sustainable energy supply towards 2050. Oil and gas licenses can all be found in the database of the Dutch Ministry of Economic Affairs and are specifically for oil and gas exploration and production purposes. The list of license applications and withdrawals is regularly updated. The database does not differentiate between conventional or unconventional resource licenses. Currently no new licenses will be awarded for shale gas exploration and old licenses will not be prolonged. The map indicates the license applications and approvals that are most likely to be for the exploration of unconventional gas.